Global Positioning System (GPS) technologies are now widely available in cars and trucks, enabling drivers to more easily reach their destinations and deal with detours and other unexpected conditions. automobiles will be highly autonomous and/or connected. These developments could enable connected vehicles to travel much closer together, reducing driver distractions, accidents and injuries while also increasing existing roadway capacity. These technologies are changing so rapidly, however, that it is impossible to predict their impact over a 20-year planning horizon. As an alternative to making predictions, this plan recognizes the technologies already impacting transportation in the region along with those expected to have the greatest potential impact in the near term. This section of the plan will be updated regularly as new technologies emerge and their impacts are better understood. Prolong the effectiveness of traffic signal timing . . .
"The process is simple. First, traffic sensors collect data. Next, traffic data is evaluated and signal timing improvements are developed. Finally, ASCT implements signal timing updates. The process is repeated every few minutes to keep traffic flowing smoothly. On average ASCT improves travel time by more than 10 percent. In areas with particularly outdated signal timing, improvements can be 50 percent or more . . .
"Special events, construction, or traffic incidents typically wreak havoc on traffic conditions. While large-scale construction projects and regular events can be anticipated, determining their impact on traffic conditions can be extremely difficult. Other disruptions, such as crashes, are impossible for time-of-day signal timing to accommodate . . .
"Outdated traffic signal timing incurs substantial costs to businesses and consumers. They account for more than 10 percent of all traffic delay and congestion on major routes alone. For consumers, this causes excess delays and fuel consumption. For businesses, it decreases productivity and increases labor costs. According to the Texas Transportation Institute, the cost of traffic congestion is $87.2 billion in wasted fuel and lost productivity. That translates to $750 per traveler . . .
"Adaptive signal control technologies are also kinder to the environment. Using ASCT can reduce emissions of hydrocarbons and carbon monoxide due to improved traffic flow." Adaptive signals have been installed within the HATS region in portions of the Carlisle Pike and Jonestown Road corridors. 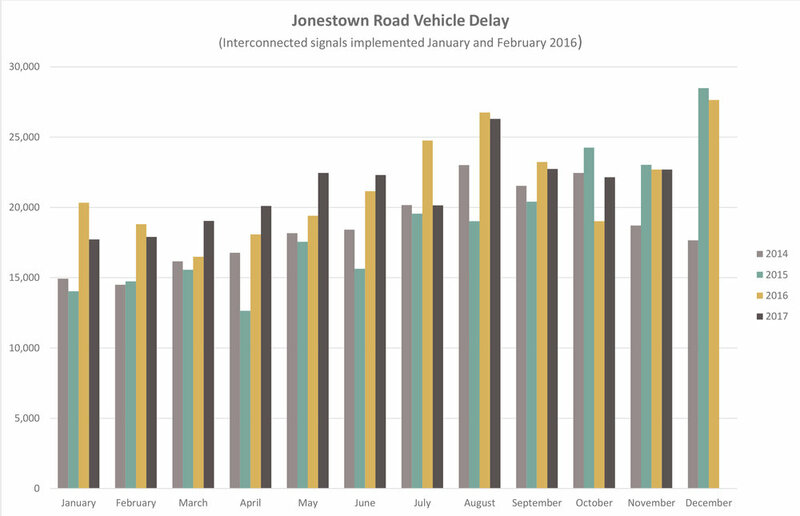 As the charts below indicate, congestion in the Carlisle Pike corridor has dropped significantly since the system became active in January and February 2016. This technology will be considered for other signalized corridors identified as highly congested as a possible means of reducing congestion without substantial infrastructure investments. Also, HATS will periodically review congestion levels in adaptive signal corridors to make sure the systems are optimized. Global Positioning System (GPS) technology is based on a number of government-owned satellites that allow for highly accurate positional information at any location on Earth. GPS mapping applications are now nearly universal in passenger vehicles, trucks, trains and aircraft as a directional aid that typically provides visual and audible directions to any designated location. GPS technology has also facilitated a number of applications that provide directional guidance for users, in many cases providing specialized service like detour guidance for congestion, accidents and road closures. Examples include Google Maps, Waze and many others. Such applications are likely to become even more numerous and provide enhanced services throughout the planning period, thereby helping to reduce congestion. However, directional GPS technologies have also led to problems with trucks in residential and rural areas because drivers are simply following the GPS directions. HATS plans to investigate the potential for working with GPS providers in identifying such constraints as vertical clearances and restricted bridges so trucks can be directed to the most appropriate routes. GPS technology is also a critical component in applications like Uber and Lyft. Usage of these applications is growing rapidly in the suburban and urban portions of the planning area. They are much less available in rural areas like northern Dauphin County, Perry County and western Cumberland County. These services may take advantage of driverless vehicle technology in the future and may significantly enhance ridesharing opportunities through small- to mid-size vehicles, much like the shared ride vehicles of today. HATS intends to track the expansion of applications like Uber and Lyft and determine their impact on overall traffic conditions, transit usage, demand response bus service, etc. Today’s transit vehicles also take advantage of GPS technology through the use of computer or smartphone based applications like “Find my CAT bus,” rabbittransit’s “My Stop Bus Tracker,” etc. These applications enable users to find the exact location of their bus and approximate arrival times. These applications are valuable to veteran users of the system as well as infrequent or new users who are not as familiar with bus schedules and routes. Such user-friendly applications should help to increase transit usage, so HATS intends to work with transit providers to determine their usage and impact on overall ridership, potentially assisting in educational campaigns if it is determined that awareness of such technology increases transit ridership. Air travel is also being enhanced through GPS technology. “FlightAware,” “FlightRadar 24,” “Trip Tracker” and many others enable users to verify the precise location of a specific aircraft and make plans in the event of delays, etc. Updates to flight schedules can be sent directly to smartphones, allowing for much more accurate passenger arrival and pickup times. Automated or autonomous vehicles (AV) are cars, trucks or buses that take full control of all aspects of the dynamic driving task for at least some of the time. A connected vehicle (CV) has internal devices that connect it to other vehicles, as in vehicle-to-vehicle (V2V) communication, or a back-end infrastructure system as in vehicle-to-infrastructure (V2I) communication. V2V applications enable crash prevention and V2I applications enable telecommunication, safety, mobility and environmental benefits. Implementing CV technology requires vehicles to be able to communicate, with "Dedicated short-range communication” (DSRC) currently being the leading medium for such applications. At present, V2V and V2I applications only provide driver alerts and do not control vehicle operation. At TCRPC's May 2018 luncheon, national expert on automated and “connected” vehicles Matt Smith (left), of Michael Baker International, previewed what local governments and communities can expect when driverless cars and trucks take to the roads in the future. As more vehicles become automated and connected, they have the potential to profoundly change personal, freight and public transportation. As producers sell AVs and CVs and consumers buy them, crashes, traffic congestion, air pollution and other impacts associated with travel may significantly diminish. On the other hand, because technology can solve some problems and create new ones, AVs and CVs may have drawbacks and risks. For example, cybersecurity vulnerabilities associated with CVs could compromise safety. Also, congestion could increase with the proliferation of AVs as driving becomes less onerous and individuals who do not drive today have more opportunities for travel. There is significant debate about the implementation rate for CV and AV technologies and their likely impacts. Given how quickly these technologies have grown, their impacts will certainly be felt long before this plan's 20-year horizon. Given the potential of these technologies to significantly improve safety and reduce congestion on our roadways -- minimizing crashes, facilitating the movement of freight, reducing single occupancy travel through ridesharing and transit applications -- it is HATS' policy to facilitate their implementation. HATS' most appropriate roles at this point appear to be education/outreach relating to these technologies to reduce residents' fears associated with their use and in the deployment of DSRC technology as a means to facilitate the most rapidly deployed components of CV applications. As such, HATS should meet periodically with PennDOT and other leaders in this field to explore educational opportunities and any financial commitments necessary to most effectively deploy DSRC (or related, as appropriate) technology.